The Loveland Pass before the Eisenhower Tunnel was a traffic-choked chore, but now the pass offers access to some of Colorado's best backcountry wilderness featuring mountain vistas for the hikers and skiers who find them. 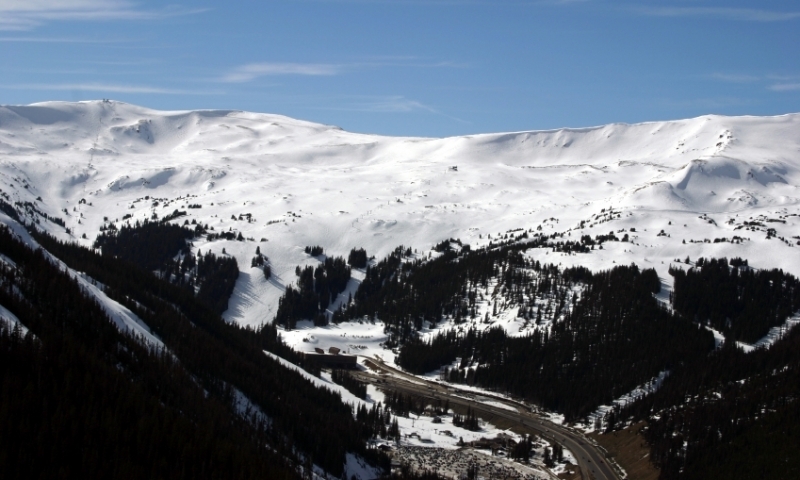 Loveland Pass is the highest road in the nation that is kept open year-round. Hikes ranging from peak-bagging to family strolls have their trailheads at the top of the pass. Backcountry skiers enjoy the easy access of the pass, meaning less hiking and more skiing. At 11,990 ft. above sea level, the Loveland Pass is the alternative route to I-70 and the Eisenhower Tunnel. Rising 800 feet above the tunnel through a series of hairpin switchbacks, you'll find yourself with a healthy grip on the handlebar. It's tough to keep your eyes on the road with the surrounding mountain views, so make sure to take a break for pictures at the top of the pass. There is a sign and some walking trails to appreciate the incredible views. Loveland Pass is on CO-6, located between exit 216 of I-70 and Keystone. The Loveland Pass is the highest road in the United States that is kept open year-round, weather permitting. The top of Loveland Pass is a trailhead for many different routes. Those looking for a little exertion should try out Grizzly Peak, a 7 mile hike to 13,427 ft. Those looking for something a little less strenuous can take a walk on the loop trail, which follows a ridge on the Continental Divide for an easy 3 mile loop. All hikes around the area will give some great views. Going up the pass in winter, particularly on days after a large snowfall, skiers can be seen hitch-hiking back up the pass to squeeze in another run. The pass is a great opportunity to get out into the backcountry of Colorado to ski some open bowls, glades or the steeps. Proper use and knowledge of a transceiver, snow shovel and probe, and the ability to analyze safe skiing terrain are necessary to ensure a safe outing. Mountain pass on I-70 between Summit County and Vail Colorado. Also known as the Million Dollar Highway, in SW Colorado. Scenic mountain pass and ski area along Colorado Highway 50. Mountain pass and recreation spot near Steamboat Springs, Colorado.